The baked crab cakes are out of this world! You’ll think they came from a high end restaurant. Serve these as an appetizer or enjoy as a meal with a salad. Trying to come up with a low fat crab cake was quite a challenge, but you won’t miss the fried version when you taste these. The sauce adds just the right amount of heat to them, but you can adjust to your taste. I highly recommend using fresh crab meat rather than canned for best results. Do not skip refrigerating the patties before baking, this really helps them stay together. In a small blender (or magic bullet) puree mayonnaise, lime juice, roasted pepper and chipotle pepper. In a large bowl, combine crushed crackers, eggs, scallions, pepper, mayo, cilantro, lime juice, salt and pepper. Mix well, then fold in crab meat, careful not to over mix so the crab remains in large chunks. Gently shape into patties using a 1/2 cup measuring cup. Chill in the refrigerator at least 1/2 hour before baking. Grease a baking sheet with cooking spray. Bake about 8-10 minutes on each side, until nicely browned. 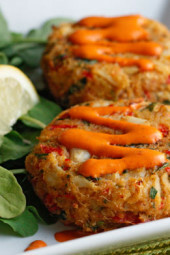 Drizzle red pepper chipotle lime sauce over crab cakes and serve. I’m about to try it! Probably 400 and a little less time…? Gina, I LOVE all of your recipes. Your site is my go-to for everything!! I just got an air fryer and LOVE that you have lots of air fryer recipes. 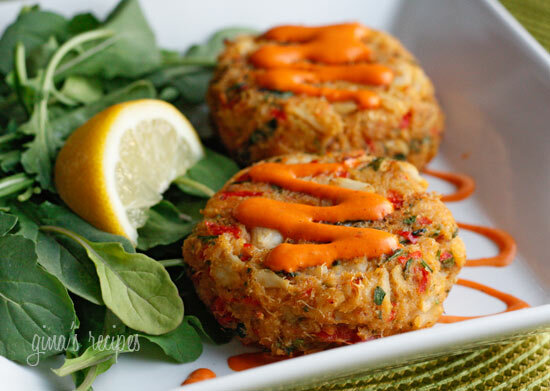 Have you cooked these crab cakes in an air fryer? If so, what tempt and time? Has anyone tried these with imitation flake style crab?